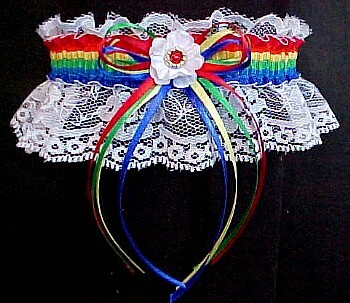 Rainbow Garter Set by Custom Accessories Garters. DRAMA DEPT: White Lace Garter with Fancy Bands™ Rainbow Band and 4 Matching Bows with Tails - In the center of the Bows is a Wedding White Double Floret Flower with a Beaded Ring and Red Pearl Eye. DRAMA DEPT: White Lace Bridal Garter or Arm Band with Fancy Bands™ Rainbow Band - In the center is a Beaded Ring with a Red Pearl Eye - can be used as a Garter or Arm Band.